COLORADO SPRINGS, Colorado – Featuring a total of 34 players, including 26 players on the National Team roster and eight players who are new additions to the 2014-16 USA Basketball National Team, USA Basketball Chairman and National Team Managing Director Jerry Colangelo today announced the roster of players expected to attend the Aug. 11-13 USA Basketball Men’s National Team minicamp in Las Vegas. The roster of attendees includes all 11 of the 12 members of the gold medalist 2014 USA World Cup Team, and nine Olympic gold medalists, including eight members of the 2012 London Olympic team. Added to the 2014-16 USA National Team roster and participating in the Aug. 11-13 USA National Team training camp are eight NBA standouts, including Harrison Barnes (Golden State Warriors); Jimmy Butler (Chicago Bulls); Michael Carter-Williams (Milwaukee Bucks); Mike Conley (Memphis Grizzlies); Draymond Green (Golden State Warriors); Tobias Harris (Orlando Magic); DeAndre Jordan (Los Angeles Clippers); and Victor Oladipo (Orlando Magic). 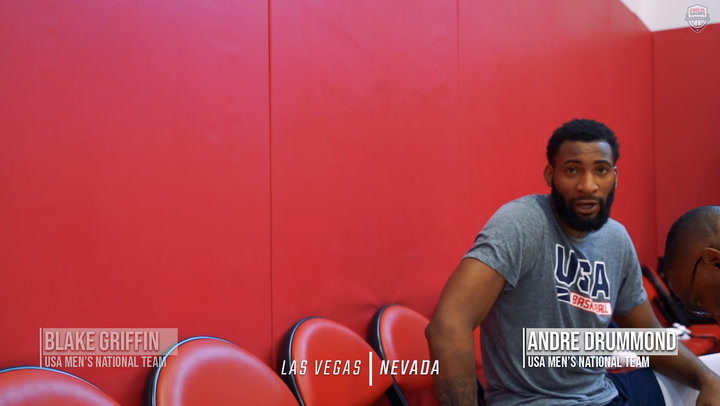 USA National Team members confirmed for the 2015 Las Vegas minicamp include: LaMarcus Aldridge (San Antonio Spurs); Carmelo Anthony (New York Knicks); Bradley Beal (Washington Wizards); DeMarcus Cousins (Sacramento Kings); Stephen Curry (Golden State Warriors); Anthony Davis (New Orleans Pelicans); DeMar DeRozan (Toronto Raptors); Andre Drummond (Detroit Pistons); Kevin Durant (Oklahoma City Thunder); Kenneth Faried (Denver Nuggets); Rudy Gay (Sacramento Kings); Paul George (Indiana Pacers); Blake Griffin (Los Angeles Clippers); James Harden (Houston Rockets); Gordon Hayward (Utah Jazz); Dwight Howard (Houston Rockets); Kyrie Irving (Cleveland Cavaliers); LeBron James (Cleveland Cavaliers); Kawhi Leonard (San Antonio Spurs); Kevin Love (Cleveland Cavaliers); Chandler Parsons (Dallas Mavericks); Chris Paul (Los Angeles Clippers); Mason Plumlee (Portland Trail Blazers); Klay Thompson (Golden State Warriors); John Wall (Washington Wizards); and Russell Westbrook (Oklahoma City Thunder). “With this being a summer where we do not have an official competition that we need to prepare for, this year’s minicamp is an opportunity to continue and expand the brotherhood and camaraderie that has been built,” said Colangelo, who has served as managing director of the USA National Team since 2005. “It will be a celebration of all that we've accomplished with USA Basketball since the National Team program was formed in 2006 while also looking ahead to 2016. The minicamp is going to be low key with light workouts, no contact, and the USA Basketball Showcase on Aug. 13 will be a fun all-star type game. “We recognize and understand that some of our players’ availability to participate is still up in the air. Some players are coming off of injuries and are not yet ready to actively participate, or they are getting ready for their NBA seasons. So, it’s a good thing that we don’t have a competition to get ready for this summer. “We’re also excited about the eight players who have been added to the National Team roster. Seven of the players have been involved in past national team training camps or have participated in past camps as a member of our select teams. All of them enjoyed outstanding NBA seasons in 2014-15 and have been on our radar for a while,” added Colangelo. The 2014-16 USA Basketball National Team coaching staff features USA head coach and Duke University’s Naismith Hall of Fame mentor Mike Krzyzewski. Serving as assistant coaches are Jim Boeheim (Syracuse University), Tom Thibodeau and Monty Williams (Oklahoma City Thunder). The 2015 USA National Team minicamp will feature practices on Aug. 11-12, and the minicamp will conclude on Aug. 13 (7:30 p.m. PDT) with the 2015 USA Basketball Showcase, a USA Blue versus USA White exhibition game at the Thomas & Mack Center. Tickets for the 2015 USA Basketball Showcase start at $15, and can be purchased by calling 702-739-FANS or online at www.UNLVtickets.com. The 34 players represent 21 NBA teams, with NBA champion Golden State Warriors featuring four players (Curry, Green, Harrison and Thompson), while two teams boast of a trio of players: Cleveland Cavaliers (Irving, James and Love) and Los Angeles Clippers (Griffin, Jordan and Paul). Eleven players were part of the gold medalist 2014 USA World Cup Team (Cousins, Curry, Davis, Drummond, Faried, Gay, Harden, Irving, Love, Plumlee and Thompson). Eight players were members of the 2012 U.S. Olympic gold medal team (Anthony, Davis, Durant, Harden, James, Love, Paul and Westbrook). Five players were members of the 2010 USA World Championship team that finished first (Curry, Durant, Gay, Love, Rose and Westbrook). Four players were members of the 2008 U.S. Olympic gold medalist team (Anthony, Howard, James and Paul). 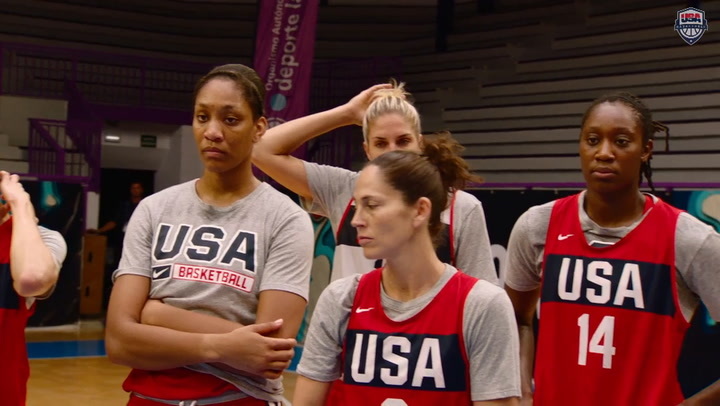 Two players were members of the bronze medalist 2004 U.S. Olympic Team (Anthony and James). The minicamp roster includes the last two FIBA World Cup MVPs – 2014 MVP Irving and 2010 MVP Durant. Curry was named the 2015 NBA regular season MVP. Westbrook earned MVP honors at the 2015 NBA All-Star Game. Butler was selected for the 2014-15 NBA Most Improved Award. Leonard was selected as the 2015 NBA Defensive Player of the Year. Four players were selected 2014-15 All-NBA first team (James, Davis, Curry and Harden), four were second team choices (Aldridge, Cousins, Westbrook and Paul) and four were third team picks (Griffin, Jordan, Thompson and Irving). Four players were named 2014-15 All-NBA Defensive first team (Green, Leonard, Jordan and Paul), and three were second team selections (Davis, Butler, Wall). The 2015 USA National Team roster includes the NBA’s top 10 scorers in 2014-15 and 18 of the top 28 scorers – Westbrook (1st-28.1 ppg. ); Harden (2nd-27.4 ppg. ); James (3rd-25.3 ppg. ); Davis (4th-24.4 ppg. ); Cousins (5th-24.1 ppg. ); Curry (6th-23.8 ppg. ); Aldridge (7th-23.4 ppg. ); Griffin (8th-21.9 ppg. ); Irving (9th-21.7 ppg. ); Thompson (10th-21.7 ppg. ); Gay (12th-21.1 ppg. ); DeRozan (14th-20.1 ppg. ); Butler (15th-20.0 ppg. ); Hayward (17th-19.3 ppg. ); Paul (18th-19.1 ppg. ); Oladipo (21st-17.9 ppg. ); Wall (23rd-17.6 ppg.) and Harris (28th-17.1 ppg.). The '15 MNT roster also includes six of the NBA’s top 12 rebounders - Jordan (1st-15.0 rpg. ); Drummond (2nd-13.5 rpg. ); Cousins (3rd-12.7 rpg. ); Davis (8th-10.2 rpg. ); Aldridge (9th-10.2 rpg.) and Love (12th-9.7 rpg.). The 2015 National Team attendees include seven of the NBA’s top 11 players in assists - Paul (1st-10.2 apg. ); Wall (2nd-10.0 apg. ); Westbrook (4th-8.6 apg. ); Curry (6th-7.7 apg. ); James (7th-7.4 apg. ); Harden (9th-6.8 apg. and Carter-Williams (11th-6.7 apg.). Ten of the NBA’s top 18 players in steals are on the 2015 MNT roster - Leonard (1st-2.3 spg. ); Westbrook (2nd-2.1 spg. ); Curry (4th-2.0 spg. ); Paul (5th-1.9 spg. ); Harden (6th-1.9 spg. ); Butler (11th-1.8 spg. ); Wall (12th-1.8 spg. ); Carter-Williams (15th-1.7 spg. ); Oladipo (16th-1.7 spg. ); and James (18th-1.6 spg.). The USA minicamp roster features four of the top 11 blocked shots leaders - Davis (1st-2.9 bpg. ); Jordan (4th-2.2 bpg. ); Drummond (9th-1.9 bpg.) and Cousins (11th-1.8 bpg.). The 2016 Olympic Games will be held Aug. 5-21 in Rio de Janeiro, Brazil. 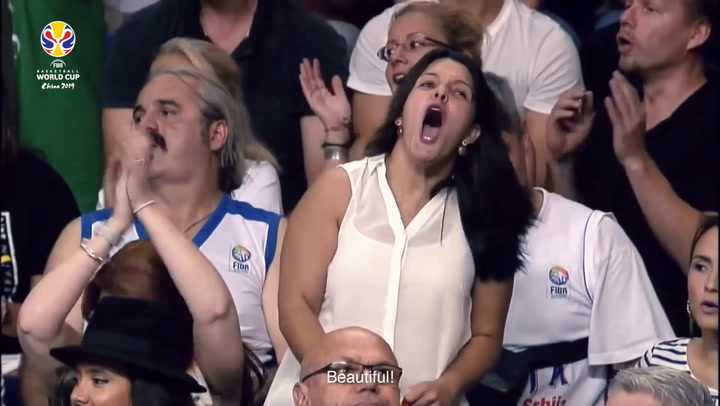 A total of 12 nations will compete in the Olympic men’s basketball competition, including the USA, which earned its berth by virtue of claiming the gold medal at the 2014 FIBA World Cup. The gold and silver medal winning nations from the FIBA’s Americas and FIBA Europe zone Olympic qualifying tournaments in 2015, as well as the gold medal nations from the FIBA’s African, Asian and Oceania zone Olympic qualifying tournaments in 2015 will also qualify for Rio, while the remaining berths will be awarded to the top finishing teams at the 2016 FIBA World Olympic Qualifying Tournament (dates and site TBD). The American men have compiled an all-time win-loss record in Olympic action of 130-5 for a spectacular .963 winning percentage. In 17 Olympics in which USA men’s teams have competed, the U.S. has captured 14 gold, one silver and two bronze medals. Since the inception of the USA Basketball Men’s National Team program in 2005, USA National Teams have captured unprecedented back-to-back Olympic and FIBA World Cup gold medals, while compiling a remarkable 75-1 overall record (.987 winning percentage), including a 52-1 win-loss record in official FIBA or FIBA Americas competitions. Based in Colorado Springs, Colorado, USA Basketball, chaired by Colangelo, is a nonprofit organization and the national governing body for men’s and women’s basketball in the United States. As the recognized governing body for basketball in the U.S. by the International Basketball Federation (FIBA) and the United States Olympic Committee (USOC), USA Basketball is responsible for the selection, training and fielding of USA teams that compete in FIBA-sponsored international competitions, as well as for some national competitions, and for the development of youth basketball initiatives that address player development, coach education and safety. USA Basketball men’s and women’s teams between 2012-15 compiled a spectacular 151-6 win-loss record in FIBA and FIBA Americas competitions, the World University Games and the Nike Hoop Summit, and posted a 76-12 win-loss record in official FIBA and FIBA Americas 3x3 competitions. 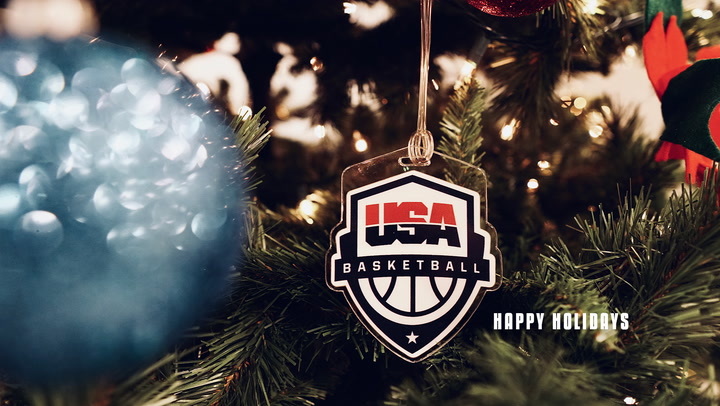 USA teams are the current men’s and women’s champions in the Olympics; men’s FIBA World Cup and women’s FIBA World Championship; men’s and women’s FIBA U19 and U17 World Championships; men’s and women’s U18 FIBA Americas Championships; men’s U16 FIBA Americas Championship; the FIBA 3x3 Women’s World Championship; and the women’s Youth Olympic Games. USA Basketball currently ranks No. 1 in all five of FIBA’s world-ranking categories, including combined, men’s, women’s, boys and girls.